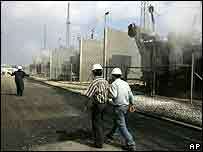 The Israeli air strikes on Gaza's only power station have led to major power shortages across the territory. Residents of Gaza are suffering rolling power cuts after the plant was badly damaged in a missile attack launched as Israel began an incursion into the territory to free a captured Israeli soldier. In some areas, the power cuts have affected water supplies driven by electrical pumps. Israel also hit three bridges in the territory rendering the structures impassable to vehicles. Palestinian leaders accused Israel of collectively punishing the Palestinian people. But Israel said that the strikes were designed to prevent Palestinian militants from moving the captured solider Cpl Shalit from the southern part of Gaza where it is believed he is being held. The badly damaged power plant provided about half of the territory's electricity, says Suliman Abu Samhadana, director of the Palestinian Electrical Company. He estimates that the damage to structure is $16m and it could take up to six months to repair. The Palestinian President Mahmoud Abbas appealed to the Egyptian government for aid to repair the power station. For now, Palestinians are continuing to receive Israeli power supplies - the source of the other half of Gaza's supplies - but the shortages continue. Before the Israeli incursion, the health ministry launched an emergency plan distributing fuel to power hospital generators in event of an electrical blackout. At Gaza city's Shifa general hospital, Dr Jomaa Sakka says that "until now there is no real problem". "But if the petrol runs out in the city then we will be facing real problems. Shifa is the main hospital and we treat about 500 patients." The Israeli air strikes on the three bridges have made travel along the Gaza Strip difficult, say residents in Gaza.